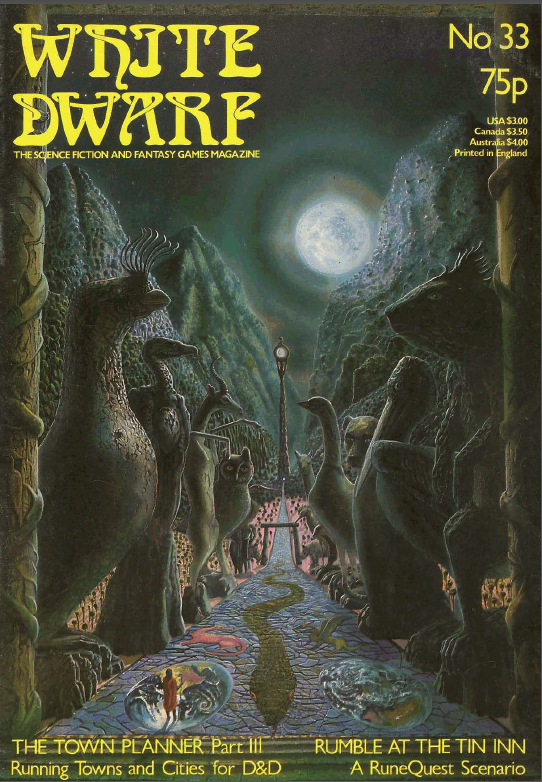 Our next monthly White Dwarf is issue #33 which brings us to September 1982, so 30 years ago. We have another great looking cover that is evocative of some alien landscape. Works for Sci-fi and Fantasy. The editorial is interesting. First on the perspective of 1982 it is a portent of change of things to come. And it is. Reading it today it is reads almost like an obituary of the Golden Age of Roleplaying games. !982 is the transition year between the Golden Age and the Silver Age. The 70's era of RPGs was over with 1982. 1983 was going to be very different. A tip of the hat then to Ian Livingstone for pointing this out. The rest of the issue feels this out. 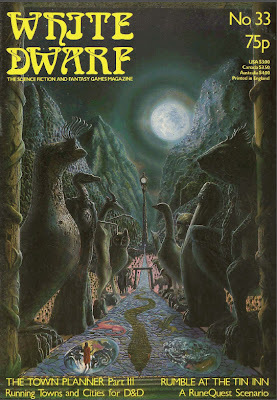 You see it in the art and layout, White Dwarf is changing again. The Silver Age is nigh. Bob McWilliams gives us some more weapons for Traveller. Actually the weapons are a from a number of people. Open Box reviews Striker from GDW. It's another Traveller tie-in table-top minis game. By this point I had thrown my hands into the air and gave up on Traveller. I would not come back to it for another 25 years almost. This is no fault of the game or GDW mind you. I just felt overwhelmed. I had purchased the The Traveler Book that year but I never got very far with that. Oh, and Andy Slack gave it 6/10. We also get the A-Series modules from TSR. Jim Bambra gave the lot a 7/10. There is also a review for the Elric boardgame and the first Gimetooth traps, which my then DM bought because of this review. To make things worse he added the traps to the A-series modules and turned it into a death machine. Elric and Traps both get 7/10. Paul Vernon is back with Part III of the medieval town. This time it is running a town and city. He covers government customs, laws and order. Something a band of "murder hobos" will likely run afoul of. I have seen a lot of people talking about this series now. Most times it is in older blog or board posts, but now I am seeing them. The consensus seems mutual, these are quite good and still work today. Perfect for the time when we all were striving for more realism in a game dominated by elves, magic and dragons. Steve Cook and Starbase pick up (almost) where McWilliams left off and covers guns for Traveller. Again there is a lot of guns here are that "futuristic" versions of modern day weapons and some SciFi staples. Rumble at the Tin Inn is a mini scenario/bar-room brawl for Runequest. I remember pulling this one for a brief OD&D session we played back in 87 or so. It was fun then, and it still looks fun now. It's the map that sold me on it. We have more combined AD&D weapon charts. Something only useful for this version of AD&D. And only if you did the weapon type vs. specific armor class. RuneRites has a collection of Invisibility and Magic points of view from Jim Sizer and Greg Stafford. Lew Pulsipher is up next with a article that rocked my world back in the day. Brevet Rank for Low Level Characters. This days I only rarely run into someone with more gaming experience than my self, and when I do it is a case of wonderment and the exchange of stories. But in 82 a year or two difference was HUGE and it meant my characters (typically) were much lower levels than everyone else's. So this idea of Brevet Rank was a watershed moment for me. Now my characters could play with the big boys. I never understood what "brevet rank" meant till I worked for the Navy years later though. I notice that in some online games, Pokemon in particular, my sons' Pokemon would gain or loose levels in much of the same fashion when they battled others online. Fiend Factory has a group of psionic monsters. All with old-school AD&D1 Psionic Ability attack and defense modes. We loved that stuff back in the day. The Monsters themselves though are somewhat forgettable. The Psitan, the Psi-mule, the Giant Mole and the Grimp. There is also Zytra, lord of the Mind Flayers who is described as being like a demon prince. Interestingly enough this creature was created by Charles Stross. There is enough here to make something of this creature; Demon Prince or not. Also forgotten are the Monstermark ratings. Treasure Chest is a mixed bag called "Witch's Brew". It includes a magical Rubik's cube like item, a spell, armor vs. disintegrate and a word search. We wrap with a few pages of ads. Again a good issue of a magazine in the middle of change.